« If the Government Doesn’t Double Tax Your Retirement Savings, Are You Benefitting from an Entitlement? 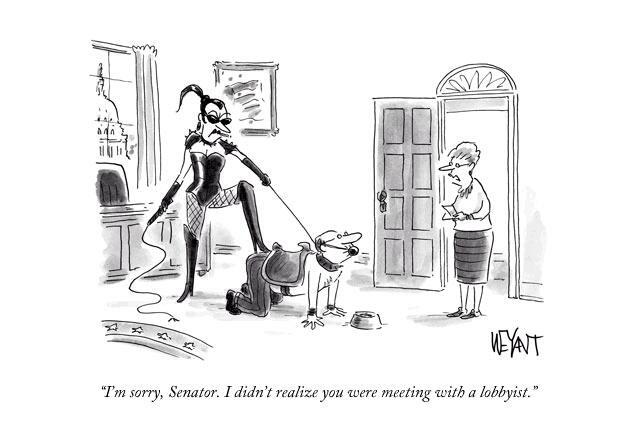 As a general rule, I don’t like lobbyists. Yes, a few of them behave honorably, seeking to protect their clients from bad tax and regulatory policy, but most of them are in the business of seeking special favors. And as government gets bigger, the opportunities for this type of corruption expand. This lucrative “industry” also helps explain why Washington is now the richest metropolitan area in the country. And it goes without saying that I also don’t like politicians (including Republicans!). So if I have a chance to simultaneously mock both lobbyists and politicians, you know I’m unable to resist. With that in mind, here’s a cartoon (I assume from the New Yorker) that showed up in my inbox. Though, to be fair, sometimes the relationship is reversed, with politicians holding the whip hand and extorting money from lobbyists. Anyhow, if you like anti-politician jokes, here’s some additional material. This little girl is rather blunt about our political masters, while a blind rabbit thinks he has found a politician. And here are a couple of good images capturing the relationship between politicians and taxpayers, and here is a somewhat off-color Little Johnny joke. I have thought for q while now we should get our elected Representatives out of Washington. With the Internet and modern communications systems we could have our representative in their home districts they could carry on their business. Multiple benefits, no more travel, no more two houses, no more central location for the lobby industry to gather, I’m sure there are more. It is often assumed that the term “lobbyist” refers a representative of a private concern, but this couldn’t be further from the truth. Federal agencies, state governments, state agencies, and semi-government entities spend public money to acquire additional federal funding. Many of these entities also conduct extensive advertising campaigns to “lobby” public support. With public money incestuously being spent for self-promotion, it’s no wonder that cutting spending is so difficult.